Read our updated Initial Evaluation of the McMurdo Fast Find. It’s leapfrog time in the PLB business and McMurdo revealed today at Miami International Boat Show their big leap forward, a new FAST FIND range of Personal Locator Beacons. The following information is culled from McMurdo press releases and their Fast Find web site. UPDATE February 28: The new Fast Find has received FCC approval. FAST FIND weighs 5.3 oz (150g) with dimensions of 1.34” (34mm) x 1.85” (47mm) x 4.17” (106mm). That’s a major reduction in weight and size over the competition, from 3-5 ounces less, and a couple ounces lighter and more compact even than the SPOT Satellite Messenger. This is small enough to easily fit in a shirt pocket. There are two models in the FAST FIND PLB range, the FAST FIND 200 and the FAST FIND 210, both to be priced at $299 or less according to the press release. This would be approximately one third to one half less than the price of competitive PLBs. The 210 model has an integral 50-channel GPS receiver. I can’t imagine why anyone would buy a PLB without GPS, but perhaps it’s all about marketing and being to quote lower prices and the like. 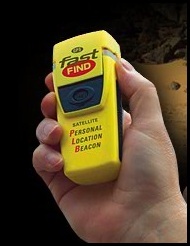 FAST FIND also includes a SOS LED flashlight facility which is manually activated. I like the concept of it being controllable by the user. It is not buoyant, so you want to be sure it is tethered if use in the water is contemplated. It is rated waterproof to 30 ft. (10 meters) for 5 minutes. I’m not sure what that translates to just floating in the water, but I suspect its probably perfectly adequate for most uses, even on the water. FAST FIND is a Class 2, rated to -20°C, and its integral battery has a storage life of 5 years. 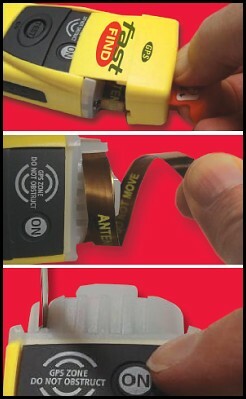 Activation is initiated by first pulling a red tab on the top of the body which pulls off the yellow plastic cap revealing the antenna, which will uncoil, somewhat like their first generation Fastfind models. With the cover gone, the activation button is now accessible. The GPS antenna is identified as being next to the ON button. The FAST FIND antenna extends up from the “face” of the PLB, so deployment is with it laying on the back, again just like the prior generation. We’ll just have to see how well it works one-handed. There is a full system GPS acquisition self-test, restricted to a maximum of 10 tests throughout the 5 year storage life of the battery. Given the size, weight and price point, if there are no hidden surprises (I’m a professional cynic), this would be a game changer for PLBs. The size and price also would make it much more enticing for those considering SPOT as an alternative to a PLB. For further information about FAST FIND visit: www.fastfindplb.com. New McMurdo Fast Find PLBs – Smaller, Lighter & Cheaper was written on February 12, 2009 and filed in Gear, News.